There are few places in Portland that really call to me. I can only take so many steaks, so much saucy French food, so much lamb’s tongue. When I want a large, comforting meal with a couple of great drinks, I tend to head for Nuestra Cocina, or “Our Kitchen”. Be forewarned, this is not your typical rice, beans and burrito Mexican food, rather it is more likely what you would be served in central Mexico. Ingredients are top-notch and dishes are complex. You can be sure chef Benjamin Gonzales is always cooking up something interesting. The interior is decorated in simple Mexican colors, nice mosaic tiles, comfortable wood chairs, and a wall of windows to the covered outdoor patio. On busy nights it can be a bit noisy, but you will be able to hear the rest of your table. The biggest drawback at Nuestra Cocina is there is nowhere to wait. The bar area is pretty small at about ten seats, so there isn’t much room, and the doorway only holds 2-3 people. On a really busy night, you may end up standing on the sidewalk. Be patient; it’s worth it. I try to go early in the week to beat the crowds. They don’t take reservations; they don’t need to. Even after years in business, they still draw a crowd. The patio area allows them to seat tables outside more comfortably. Gas heaters have been installed for cool evenings. During the warmer months, this is a great space to while away your evening. A chef’s counter seats seven and is a marvelous place to watch the action. On a busy night it can be a show, on a slower night the cooks will chat a bit and answer questions. They all seem like genuinely nice people, and it is fun to watch them work. Tortillas are all made to order the old-fashioned way, shaped into little balls by hand and then squeezed with a wooden tortilla press. Sit at the chef’s counter and you can watch them being made. They are simply wonderful, addictive little gems, constantly made all evening, delivered piping hot to your table with a smoky chipotle sauce. The Ceviche – raw seafood marinated (cooked) in citrus – varies from season to season. It is a simple preparation, as it should be, of lime, chopped fish, tomato, chiles, and cilantro, surrounded by tortilla chips just out of the fryer. They rotate the fish depending on what is available. Most of the time it is pretty darn good ($9). beef; all the ingredients tango together in a way that will make you wonder if you could get away with licking the plate. A crowd favorite seems to be tacos de puerco, I get them every time. Spiced shredded pork is piled on the little fresh tortillas, topped with a bit of cilantro and a little chopped onion. You get three to a plate for $7.00. One could easily make a meal of these and a salad. 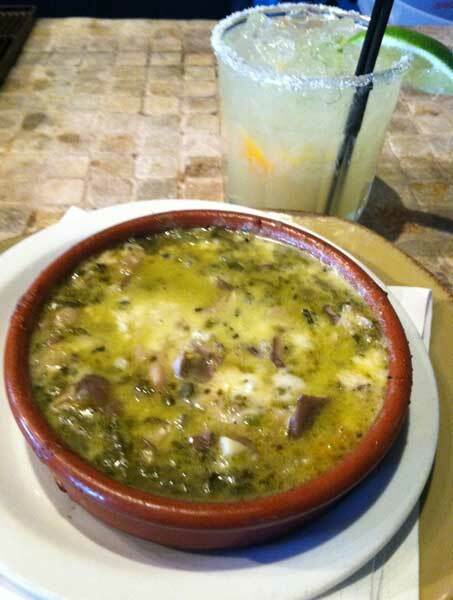 For those who are not on diets, try the Queso Fundido. 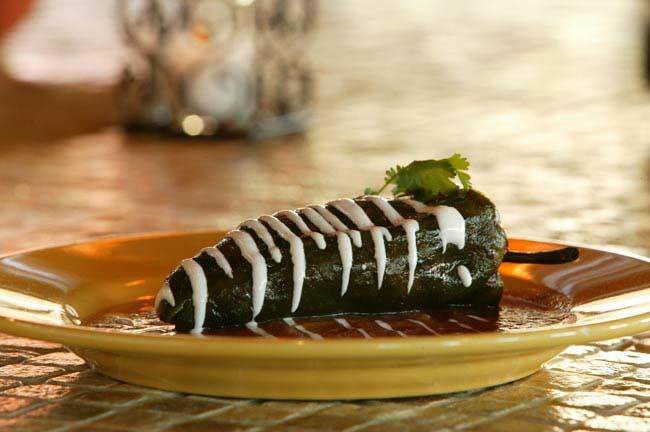 Baked Oaxacan cheese arrives bubbling hot in an earthenware dish, full of little slices of mushrooms and a slightly spicy poblano chile sauce. Scoop out the melty goodness with accompanying chips ($8). We’ll start with a Willamette Valley lamb shank ($18) The shank is huge, hanging over the edge of the bowl, making one feel like Fred Flintstone. Underneath is a healthy pile of perfectly cooked mixed greens. The bowl is finished with a deeply flavored tomato broth; mixed with the other ingredients it is almost like a stew. A selection of toppings come on the side, but unless you have a particular aversion to one of them, I’d suggest dumping everything into the bowl to get the most out of this dish. Cochinito pibil – Carlton pork with pickled red onion – comes swimming in a huge plate of wonderful black beans, simmered in beer. The pickled onion is a great counterpoint to the pork. Most nights, the pork is fork tender, with wonderful bay leaf flavor along with little bursts of cilantro. The meat has the right amount of crusty char on the outside, and has obviously been braised for a long time. A little tower of pickled red onions on top adds another layer of flavor and texture. This dish is a winner ($17.00). 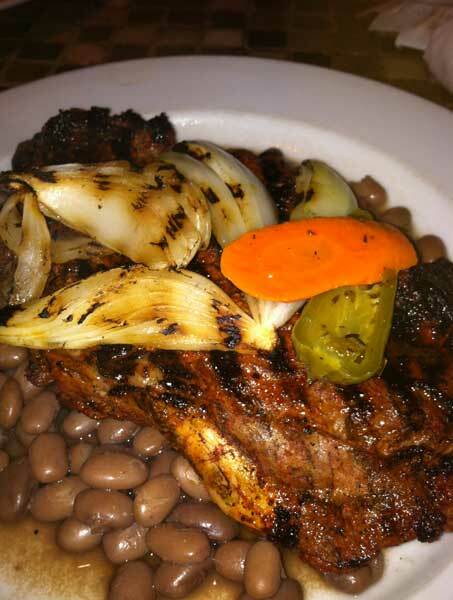 I think my favorite of the entrees is puntitas de res en chile chipotle ($18.00). 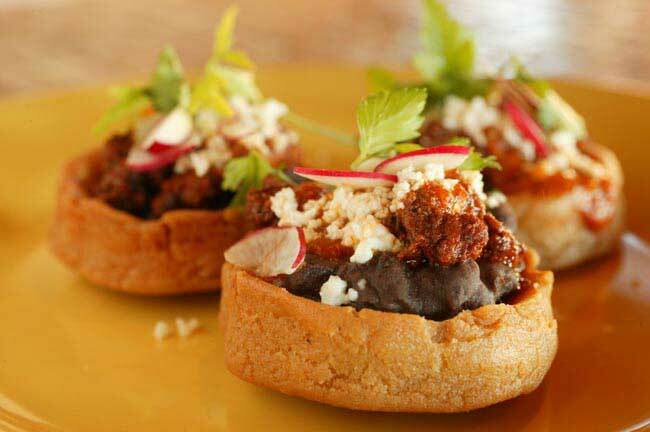 Picture sauteed beef tips, meaty and succulent, braised in wonderfully earthy, smoky chipotle. Plenty of sauce, thickened with a bean purée, comes on the plate, just waiting to be scooped up into those fresh tortillas. The finish is impeccable, lasting well beyond the last bite. Irresistible strips of chayote give another texture and flavor. I use this word so much it is in danger of being added to the restaurant review lexicon, but zounds! One good meal. Lift your face out of the tequila and order desserts. The cinnamon ice cream is the best I have ever had. (You can also get it from the vendor at PortlandFarmersMarket). They do a great job with empanada de limón, a light handmade pastry, filled with lemon curd, deep-fried, and served with excellent whipped cream and homemade caramel on the side. The pumpkin sorbet with cinnamon fritter didn’t quite work for me; I just didn’t like the pumpkin flavor with the texture of sorbet, though the fritter is nice and hot from the fryer. Another favorite is the crepes with cinnamon and banana – all warm and gooey. During the cooler months, they often have champurrado, a spiced Mexican hot chocolate, thickened with corn flour. This is a very traditional drink, usually served with Christmas tamales. Here it comes with a hot cinnamon churro on the side; a must for any hot chocolate lover. The bar does a great business, and uses quality ingredients. Of course they specialize in tequilas, with 16 available from the Sauza Hornitos to the more high-end types like Añejo Tres Generaciones. The menu goes as far as to break them down by type: plata (silver or white) – the purest form, Reposado, which are aged for at least two months, or Añejo which are really easy to sip. Ten beers are available – nine by the bottle, two on tap, and 11 wines by the glass or bottle at a reasonable markup. We aren’t talking fantastic wines here, but they are certainly an unusual and interesting list. It doesn’t matter to me, I’m going for the margaritas, and have six different ones to choose from, all fresh juices and muddled fruit. They range from $5.50 for the most basic to $8.50 for the top-shelf. There is also a list of “Tequila Martinis” for $9, sangria, mojito’s etc. On a warm afternoon, a pitcher of sangria can be just the thing, and is only $14. Wait… you wanted some too? Besides the food, one of the reasons I like Nuestra Cocina is everyone genuinely seems glad to be working here. You can tell they are like a family, happy being together. For me, that seals the deal. They will always be on my list for a good meal. Hours: Tues-Sat: 5:00pm-10:00pm. No reservations – get there early to beat the rush. Are you serious about the ceviche?! Granted, I have only ordered it once, but that was enough. It’s distinctly reminiscent of cat food. There is a smokiness to it…it seems like the kitchen wants to keep it longer, so they used smoked fish. And it’s all macerated together. It’s such a mistake. Ewww. But I agree with rest of your review. I love the place…except for that dish. I agree with Angelhair. I’ve had the displeasure of their ceviche twice and it’s my least favorite version at a midscale place in town. I’d have to go to a crappy taqueria for worse. It’s been at least six months since I’ve had it, so maybe they’ve improved it, but I really didn’t like it. I think their appetizers are fairly consistently worse than their entrees. The sopes are my favorite. I do like the fresh made tortillas, though. I think their two best dishes are the cochinita pibil and the huachinango, both cooked in banana leaves. I don’t think I’ve had the shank. I agree on the cinnamon ice cream, but most of their pastries have disappointed me. I much prefer Taqueria Nueve’s pastry work. I’m glad you noted the thing about being closed this week. I almost went tonight and was planning on going tomorrow. Guess I’ll do Nueve (which actually, I like a little better overall). Still no Cafe Azul, but certainly a place Portland can be proud of. I just wish the apps and desserts were as good as the entrees. btw, is the churro freshly fried? Oh, yeah, I love the cinammon ice cream. I had that the first time we ate there. That and the after-dinner almond tequila — what a combination! I had one of my best meals/experiences in a long, long, time here and it consisted of all of the appetizers. If MSG thinks they pale compared to the entrees I’ll have to have an entree next time. The only thing I didn’t like was the ceviche but it was my companions that insisted on ordering it. I’ve never found T.Nueve as good as the money they charge and when I was at Nuestra, Billy was there checking it out. Oh yeah-ditto on the almond tequila. Cautionary note about almond tequila: The last (and first) time I drank it was at some new friends’ dining table, and the next thing I knew, I was waking up on their couch, with no idea how I’d gotten there. (Apparently, I’d walked.) If, like my hosts and husband, you feel that passing out at a dinner party for four is “really cute,” then go ahead and have three shots. Well hmmm… I guess I’d better go back and try the ceviche again. According to my notes, I had it on a Tuesday while sitting at the counter. The chef said it had just been made. 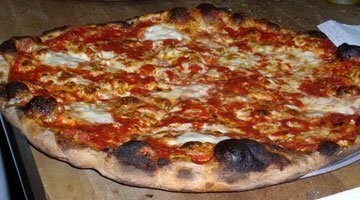 It had really good texture, bright, fresh flavors. I’ll go back when they reopen. MSG, I’m pretty sure the churro was freshly fried. Sure tasted like it, and I know they fry those lemon curd turnover things, so I imagine they use the same oil. It was piping hot. I’d better double check on that almond tequila too. In the name of research, of course. My experience in the last few months is that the appetizers are better and more consistent than the entrees. I know the owner is not doing as much hands-on cooking now, but the rest of the staff is pretty much the same. I’ve heard from shephard friends that sheep’s tongues are much more tender and caring! girl cook is right on. After a succession of disappointing meals at a number of new, highly touted restaurants like Lovely Hula Hands and Gotham, my wife and I had agreat experience at Nuestra. We concentrated on the appetizers including a tamarind shrimp that was perfectly grilled and consisted of a generous portion. The shredded pork tacos had raisins as an ingredient and it came off quite well. We also had a sauteed diver scallop appetizer wrapped in bacon which like the shrimp was masterfully prepared. The only appetizer which didn’t come off was a pumpkinseed mole, and being a mole afficinado it was bland and lacking in flavor. The Carlton pork with red onion was pretty amazing as well. I absolutely don’t eat fish, but my wife had the entree special of the night which was Escolar. It was perfectly browned and had the consistency of steak, with a wonderful flavor. To her consternation I ate most of her entree. Equally impressive was the service–very attentive yet not cloyinjg, and our server was happy to make recommendations and explain dishes. We sat at the counter and conversed with the line cooks who were a joy. This isn’t just good Mexican food–this is just plain great food. So you make a basic assumption when you walk into a restaurant and see the owner behind the line, flipping plates onto the rail like it’s goin’ outta style… and, as a restaurant worker in portland, you think to yourself, “i respect this.” and then you ask the manager how long your wait will be. he calmly assures you it’ll be no longer than half an hour, “you’re the only ones waiting.” at the counter overlooking the action, there are a couple girls eating tacos, an empty seat surrounding both on the outside. you politely ask the manager if it would be a possibility to move these chicas down a spot so you and your hombre can grab two seats together. he shoots you down. no way. you gotta wait. 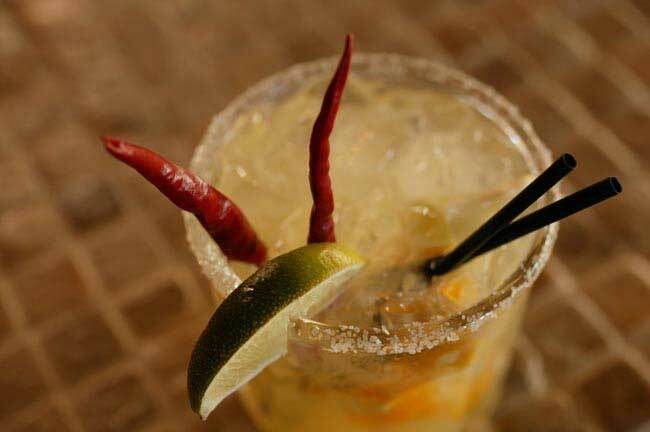 a sport, you sidle up to the drinks-only bar, and order a couple sinfully delicious chile-infused margaritas, encrusted with salt and steaming your lips with the essence of sun-dried peppers. an hour passes….. and then another 30 minutes. at this point you have grudgingly acquiesced to three of these chile-infused margaritas, whose charms have long worn off, and now you are simply sucking them down to stave off the mounting fury building in your temples. the manager is nowhere to be seen. When found, you ask casually how much longer it will be. He dodges. He melts into the periphery, returning in ten minutes to announce that he has found you a spot! Hurrah! We follow eagerly, to discover that he has finally asked the two young ladies at the bar to move over. So we have waited an hour and a half for spots that were essentially available when we walked in. The food was terrible. My partner’s steak tasted like the sugar hearts you receive on Valentine’s Day, chalky and over-sweet. It was presented over bland pinto beans that positively begged for cilantro. My pork was dry; our appetizer prawns burnt to a crisp. The owner appeared to be the only one working the line, aside from the tortilla lady (we loved the soft-warm freshness of the tortillas). Being a restaurant employee, and simultaneously being literate, I recognized our food ticket (the proximity to the line is dizzying), and watched it get physically pulled back in line over and over again as the night progressed, as the owner deprioritized (is that even a word?) our entrees over and over again…. What was intended to be a pleasurably brief bite out in the neighborhood turned out to be 4 straight hours of culinary abuse. No way will this girl go back. What’s up with the hype? I visited Nuestra Cocina after hearing many good things about it on a busy Friday night during all the recent rain. I popped in about 7:45 prime time and the place was booming. I was informed of a 45 minute wait and my companion decided to sit outside under cover of heat which provided amble warmth in addition to two mojitos for me and two margaritas for her. We asked for some chips and salsa are were greated with thick, salted chips and spicy but not hot salsa. This made the wait much more palatable. We were seated at a high table in the corner near the “waiting bar” and I watched the many employees hustle to and fro completing many tasks. One woman was employed to hand roll the tortillas from a batch of fresh corn. These tasted extremely fresh and were a nice way to start the meal. We ordered the ceviche, which i had read about here, and I enjoyed it although the taste seemed to fade quickly. It was sharp and rather good. My friend had the pork which she greatly enjoyed as did I, although it may have been a bit too dry. I had the half chicken in mole sauce served with baby carrots and it was plump and tender and the mole was right on. I enjoyed the baby carrots, simply prepared. Service was attentive and friendly while busy, which is a good sign. I was most impressed with the spirit of the place where all employees seemed to glow with enjoyment. I will certainly be back. I love, love this restaurant. The food is always good, the atmosphere very comfortable and welcoming, and the whole experience satisfying. That said, we ALWAYS get there early, or you will wait. We live out of town for awhile now, and always go back there when we visit. Try the chocolate pound cake with cinammon ice cream for desert, it is wonderful. And try to sit at the bar to watch the cooks create if there are only a few of you. But always get there early!! Looking at their menu, would it really be that hard to have more than one vegetarian entree? It’s a Mexican restaurant, it shouldn’t be too hard. This is my go to place, too. Never had a bad meal nor a bad margarita here. A favorite, thought I still pine for Azul…. Fine. Ruin everything by bringing up Cafe Azul! Now I will be grumpy all evening. Just as a note: my comment above is WAY out of date. Their ceviches are quite good now and rotate. I think they’re probably the most consistently good of the midscale Mexican now, though Mextiza and Autentica probably speak to me a bit more.